The collaboration of Kostas Voutiras, who is born in Kordelio of Thessaloniki and Agathonas Iakovidis started six years ago by live performances. Their common passion for the Greek cultural heritage leads them to the recording of the CD “In Smyrna and Kordelio”. 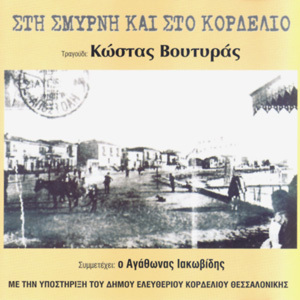 The album contains 14 traditional songs from Smyrna and Kordelio interpreted by Kostas Voutiras. Agathonas Iakovidis participates vocally in 3 songs and orchestrated the music. A CD with songs from two regions that experienced almost absolute destruction in 1923, dedicated to all those that saw their homes and lives destroyed more than 80 years ago.